Last week in this blog I shared a powerful video for you to consider integrating into your fatherhood program. I have another such video to share this week. But, first, some background. If you're a regular reader of this blog, you know that I spend a good deal of my time communicating with direct-service providers that use our fatherhood programs and resources. I learn a lot from these discussions that I share with readers of this blog and when conducting trainings and providing technical assistance. Earlier this month I had the pleasure of talking with staff at UIH Family Partners (Trenton, NJ), an organization dedicated to serving dads that uses the 24/7 Dad® program. As I prepared for the interview, I visited the organization's website. (It's a fantastic website. Look for a post about it in the coming weeks.) 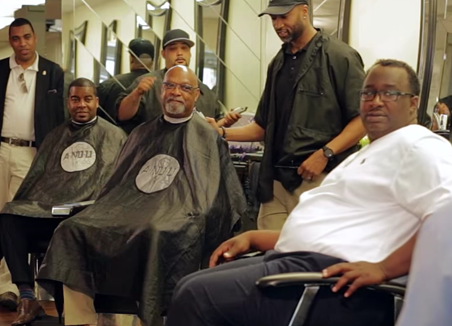 The homepage includes this excellent nine and a half minute video of African-American dads in a barber shop discussing the vital role of fathers in the lives of children. The importance of a dad's role generally. What children need from their dad. The importance of a dad placing his children's needs first rather than his own needs. How they felt when they first learned they would be a dad. The challenge of raising children as a non-custodial dad. The differences in raising children in decades past compared to today. The lack of safe places for men to come together and share their fathering wisdom with one another and in which to mentor children as a community of dads. The symbolism of the video is as important as the content of the dads' discussion. It shows the power in a group of dads coming together to share their wisdom in a safe place, which programs like 24/7 Dad® help create in the absence of such places in the community (e.g. a barber shop). It also shows how much men care about their role as a dad and how many of them understand their importance to their children's well-being. Given its content and symbolism, I encourage you to think about where to integrate it into your fatherhood program. If you use the 24/7 Dad® A.M. program, for example, you could show it as part of Session 2: What it Means to be a Man or Session 6: The Father's Role. If you use the 24/7 Dad® P.M. program, you could show it as part of Session 5: Family Ties. Regardless of the program you use, the video could serve as a part of an introductory session to reflect the kind of community your fatherhood program seeks to build. I hope you find the video useful! Have you considered creating a video of your program's impact to share with future program participants or to use in your recruitment efforts? In what ways do you show dads the value in being part of a safe, sharing community of dads?